Using this handy dandy graph, I estimate that by the time climate change forces a response we will need to reverse 2° Celsius of heating. The method for temperature control is described in here - a sunlight blocking satellite. What percent of the sunlight destined for Earth needs to be reflected/redirected? The question above presupposes 1%. But where I live there is a 14° variance in temperature which happens over 8 hours (1.75° per hour). The satellite would block light 24 hours per day so by my calculations we could cool the Earth 2°C in 5 days. I assume my math is wrong. But assuming we want to cool the earth over 20 years, what percent of sunlight actually needs to be reflected? 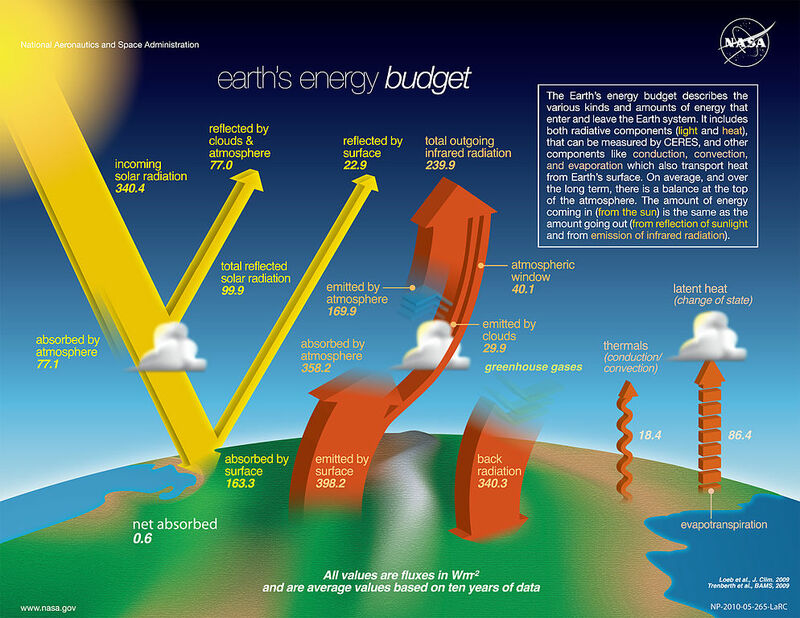 According to NASA's energy budget, the Earth is absorbing 0.6 W/m$^2$, average worldwide over a whole year. This is the energy addition that is causing global warming. The Earth receives from the sun 340.4 W/m$^2$, average over the planet and year. Divide the two, and you see that we need to reduce incoming radiation by 0.2%. Not the answer you're looking for? Browse other questions tagged space-constructs climate-change or ask your own question. How would a solid shell surrounding Earth affect the climate? How slowly would continental gears need to turn to not destroy everything? How much would it cost to build an orbiting “Princess”? How high would a space elevator need to be on Mars?